You crouch down, turning up your collar against the steady drizzle as you start across the tarmac under a dark and threatening sky here at Willard Field in Champaign, Illinois. As you head for Four Six Foxtrot, which is fueled and ready to go, you carefully sidestep an extra-deep rain puddle on the ramp, pointing back to it for the benefit of your clients, who are right behind you. The group consists of two raincoat-clad businessmen and an umbrella-shrouded businesswoman who need immediate high-speed transportation—and in view of the weather, you've decided to take them yourself. handle most of the air taxi and charter flights you provide, but you like to keep current, and today's weather offers the kind of challenge you relish. 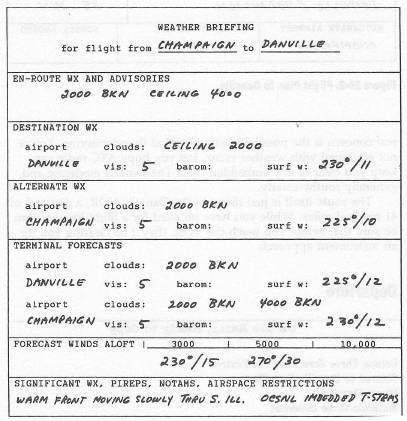 Your three clients have requested air taxi service to Danville, without delay, and you've already checked the weather and filed IFR. The weather is generally grim, but not forbidding. You have actual IFR conditions and low ceilings throughout the area, but your only real concern is the possibility of embedded thunderstorms. You're not equipped with weather radar, but you hope ATC radar can keep you clear of any embedded cells. The wind is moderate and generally southwesterly. The route itself is just direct to the Danville VOR, a distance of 41 nautical miles. While you have no need for a flight log, you can be sure that before you reach the VOR, they'll be clearing you for an instrument approach. Squawk one two two four. And bear right at the fuel pumps. Four Six Foxtrot Tower on one two zero point four so long. 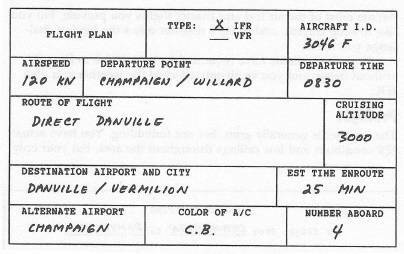 You're cleared direct to the Danville VOR. Expect the VOR Approach to Runway 21. You locate the approach plate—which you've used recently on another air taxi flight to Danville—and study it, noting that because of the direction of your arrival at the VOR, this time you'll have to first turn outbound and execute the procedure turn. On one two zero point four so long. Contact Ground on one twenty-one point eight see ya. Four Six Fox Danville Ground where to? That's straight ahead to the red brick building.